Subwoofer recommended in home theater systems, optional in music only systems. Nobody I know of who heard the original Ohm A speakers thirty five years ago ever forgets the experience. They were tall, bulky and expensive. But when they were allowed to speak, they vanishedâ€”leaving behind a wide, deep sound field with an articulated and detailed midrange, highs without a hint of grit or sibilance, and lows with neither hollowness nor resonance at any level they were driven and in any octave anyone could hear. And whether the music was played by a symphony orchestra, a jazz ensemble, or single human voice and whether you walked left or right or even through the middle of the pair of Ohms, the stereo image stayed solidly in place. It was as if in disappearing they took the room with them, leaving behind the concert hall or club or chamber that the music had been played in. They sounded so well because of their remarkable down-firing single driver, invented by Lincoln Walsh and developed by Marty Gersten to produce the entire audible range seamlessly and without any crossover components. But the driver’s mass and orientation required both powerful magnetic assemblies and equally powerful amplifiers. Inevitably, the drivers had to fail. I thought the company itself had failed; but when I learned that Ohm Acoustics had reinvented itself as an enterprise that dealt directly with consumers via the internet and after I read some very favorable reviews of the MicroWalshes, I talked with the Ohm folks and bought a pair of MicroWalsh Talls and their SB-5.2 subwoofer. That was six or seven years ago. They arrived quickly and safely; but though they sounded good initiallyâ€”smooth, clear, and spaciousâ€”they were a little thin. Maybe with good reason: because my listening room is large (24 by 24 feet), oddly shaped (5-foot knee walls supporting a gabled roof 15 feet high), and very live (the floors and ceiling of bare wood, the gable walls of bare plaster and glass with nary a rug or drape to cover them) because of my allergies,. I called Ohm and talked with John Strohbeen, the engineer who heads the company. I asked whether I should consider trading up to a bigger model. John said wait a month or two for them to break in (the Ohms come with a 120-day money back guarantee). He was right. Their range, clarity, and sound stage expanded significantlyâ€”much like the original Ohms I had heard decades ago, even though they and their subwoofer cost less than half that of the originals. I drove them for years with an NAD 30-watt stereo receiver which played larger than its spec. Somewhere along the way I turned off the subwoofer. It just wasnâ€™t needed for the music I likedâ€”jazz ensembles and an occasional orchestral classic. The MicroWalshes have surprising bass extension all by themselves, essentially flat down to the 40-something Hertz range, when they are well broken in. A month ago I replaced the NAD with a considerably more powerful and versatile pair of separates, a Sherwood Newcastle P-965 Preamp/Tuner and A-965 Amplifierâ€”the latter capable of 200 watts per channel at 4 ohms with two channels driven; and then I fired up the Ohms with the Sherwoods set to a jazz channel on XM radio that happened to have a1950′s vintage Ella Fitzgerald number playing. Before I replaced the NAD, I might have said that the MicroWalshesâ€™ greatest virtue is that I never tired of them, as I had with a precession of good but conventional closed and vented box speakers. And I would have been wrongâ€”because I was dazzled by what I heard. The little Ohms had disappeared; and there was Ella in the room she sang from, solidly positioned in the center of the field no matter where I walked. There too was much of the wondrous Ohm A sound stage with just about the sort of the depth, clarity, and range I’d been impressed with decades before. I found myself being drawn into the clichÃ© you hear from anyone who gets a good new audio componentâ€”the compulsion to play all oneâ€™s old favorites. Sure enough, I discovered not just nuances but whole new layers of musicality I had not heard before–like the three different halls and two different studio venues from a Willie Nelson CD that hadn’t shown them before. The battle scene early in Master and Commander was a revelation. The thuds, thumps and horrific crack and crash of cannons coming from the Ohms shook my 24 by 24 foot plank floor so well that I had a hard time wiping the smile from my face. And that was without the subwoofer. The Sherwoodsâ€™ power had given the MicroWalshes the â€œairâ€ to drive my big, live room. So I turned the volume up; and what happened is what’s supposed to happen when you have a good, tough set of speakers driven hard: the Ohms just got louder. But I also met the dark side of the clichÃ©: a good sound system inevitably reveals the deficiencies of the media you play. And some of my favoritesâ€”the voices of Tierney Sutton, Judy Wexler, and Norah Jonesâ€” consistently displayed a hollow, strident segment in the upper midrange that I had not heard much of before. 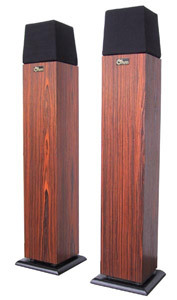 I remembered that John Atkinson (www.stereophile.com/floorloudspeakers/687ohm/index.html) reviewed a pair of the larger Ohm Walsh 5′s some years ago and was puzzled by the same sort of coloration. He swept the Ohm tweeter range with a 1/3 octave band generator and found them essentially flat. Lacking the test instruments, I played a Blu-Ray setup disc that drives each speaker with a 20 to 20,000 Hertz sweep and heard no resonances in the upper register.Then I jacked a pair of decent headphones (Grado 125′s) into the front panel of the preamp and listened. I heard the identical coloration that I had from the speakers. So I fed the Ohms a recording with neither electronic nor room acoustic enhancements, Madeleine Peyroux’s Half the Perfect World (Rounder 11661-3252-2). I heard no resonances, no hollowness, no coloration from the Ohms; but I did hear the trumpet breathe on the discâ€™s last track. I was satisfied that the Ohms werenâ€™t adding coloration. The opening of 2001, A Space Odyssey taxes the MicroWalshesâ€™ bass range. But with the SB-5.2 sub turned on, the small Ohms played the 20 Hertz or so organ drone at high levels–as they did with other virtuoso organ pieces. In fact, the Ohms have such spaciousness and presence when driven by two-channel mix-down codecs like Dolby VS that I’m not sure I need to supplement them with a couple of extra pairs of channels for HD movie viewing. Some reviewers of the MicroWalsh Talls recommend them only for rooms a good deal smaller than mine and with a lot more square feet of sound absorbent surfaces. I’m sure that’s good advice, but I found that the little Ohms absolutely glow in a big, live environment. Impressively smooth, detailed, sound field with great width, depth, and stereo solidity. Surprising bass extension. A bargain entry to high end listening. â€¢ You’re not going to find them at your local big-box store, or even your local high-end dealer. â€¢ You’ll need the better part of a thousand dollars to try them out. â€¢ If you really need the bottom of the lowest octave you’ll want to add a subwoofer. â€¢ Your receiver or amp should be able to provide at least 30 clean watts at 4 ohms for modest-level listening; but 75 honest watts or so will let you hear much more of what the Ohms can say. â€¢ They play what they are fedâ€”no more, no less. â€¢ Unlike the original Ohm A’s, they don’t break easily. â€¢ They don’t mind big, live spaces to live in. â€¢ They project a wide, deep sound field so stable that you can walk around or even between the speakers and the stereo effect stays put. â€¢ Because they don’t sound like boxes, you probably won’t tire of them. â€¢ They’re so small and nicely finished (especially in Rosewood) that they pass the â€œwife factorâ€ test with flying colors. â€¢ You might not need center or surround channels to enjoy movies. â€¢ Theyâ€™re made in the USA. â€¢ You can talk to the president of the company, and heâ€™ll give you good advice. Top Ranked Products from Ohm.